Monaco — The rapidly changing climate in the Arctic is putting pressure on hundreds of thousands of indigenous people in the circumpolar North. For decades they have been witnessing a dramatic shift during the Arctic Ocean’s open water season, as sea ice retreats further and further from coasts. Industrial development and shipping are expected to rise in its place. The Principality of Monaco hosted and supported a four-day meeting in early March, which was organized by UNESCO to address the concerns of the Arctic community and identify strategies for the sustainable development of the region. Experts in the social and natural sciences, ethics, education, and international affairs sought the local expertise of indigenous peoples in drafting a set of recommendations for follow-up action. The discussions engendered an integrated approach toward facing challenges in the Arctic. “For the first time as an Alaskan Inuit I feel great hope because my words were taken seriously and weight was put on them,” said Mayor Edward Itta of the North Slope Borough in Alaska and president of the Inuit Circumpolar Council (ICC). Instead of telling Itta how the Inuit population will need to change their way of life to adapt to the changes occurring around them, as he said was typical of other meetings he had attended over the past 15 years, the experts at this meeting made a pointed effort to draw on indigenous expertise and acknowledge the value of maintaining traditional cultures. “This is the first time in many, many meetings similar to this that I actually felt useful to my people,” Itta said. The 42 participants of the meeting concluded that a key challenge to achieving sustainable development in the Arctic will be in coordinating the interdisciplinary and international effort necessary to confront the changes that an ice-free “blue” Arctic Ocean will bring to the northern ecosystem, the culture and livelihoods of indigenous peoples, and economic activities in general. “The Arctic and its population engaged in traditional activities should not be viewed as a system of early warning but as a system of early rescue,” added Larissa Abryutina, vice-president of the Russian Association of Indigenous Peoples of the North (RAIPON). There are 200,000 indigenous people living in Russia—80,000 of whom are living in the Arctic, she explained. The group concluded that the challenges of maintaining and enhancing the prosperity and cultural well-being of the people of the Arctic are often complicated by drivers of change which have non-Arctic origins. In addition, scientific, developmental, and conservation efforts are often driven by interests outside the Arctic. “Action formulated to address Arctic issues must begin from an understanding that many of the peoples of the Arctic have self-governing institutions. These peoples and their institutions have immense creativity and seek to advance the self-determination, prosperity and aspirations of their communities and their regions,” they added. 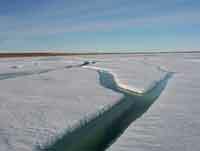 The recommendations include establishing “a working/advisory group to develop dialogue and strategy on the challenges of climate change for circumpolar indigenous peoples, including safeguarding intangible heritage and building synergies between indigenous and scientific knowledge.” Other objectives range from promoting employment opportunities through the conservation of traditional forms of activities for circumpolar indigenous peoples, to improving the access researchers have to exclusive economic zones in the Arctic. The recommendations were the result of a consensus among the participants. Included at the meeting were indigenous peoples working with the Russian Association of Indigenous Peoples of the North (RAIPON), the Inuit Circumpolar Council (ICC), and the Saami Parliament. Also attending were representatives of the Arctic Council, UNEP and UNESCO. With participation not only from all Arctic States (Canada, Denmark/Greenland, Finland, Iceland, Norway, Russia, Sweden and the United States) but also elsewhere in Europe, and from as far away as New Zealand, South Africa, and Japan—the meeting provided testimony that what happens in the Arctic is of interest on a global scale. “Today’s meeting would have been inconceivable only a few years ago,” said H.S.H. Prince Albert II of Monaco, who visited the Arctic in 2006 and recently Antarctica. “People’s minds have opened up to a new solidarity with those distant lands,” he explained. The Principality of Monaco hosted and supported the meeting, which UNESCO organized with Professor Jean Malaurie, UNESCO Goodwill Ambassador in charge of Arctic polar issues. Director General of UNESCO, Koïchiro Matsuura opened the discussions. An important aspect of the meeting for Professor Malaurie was to harmonize the international dialogue with the voices of indigenous peoples and Arctic communities. Understanding climate change begins with understanding its effects on the people living most intimately with the changing land, sea and air, he said. “Don’t lose sight of the people, animals, and plants that live on this land,” he requested of UNESCO. Attending the opening day of discussions along with Achim Steiner, Executive Director of the United Nations Environment Programme (UNEP), Mr. Matsuura applauded the bold mandate of the meeting. “Adaptation and response have become an unavoidable necessity. The development of appropriate adaptation and response strategies has therefore emerged as a central preoccupation of all actors, including the UN system,” he said. “The United Nations Secretary-General has labeled climate change as ‘the defining issue of our era,’” Matsuura added.